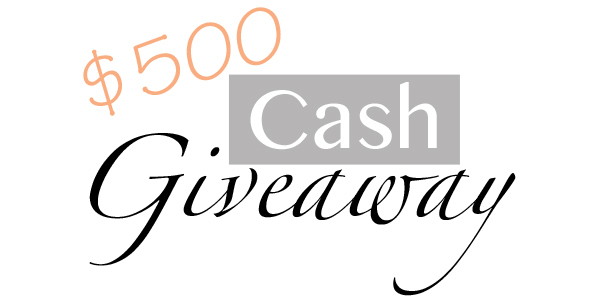 The Freckled Fox: A $500 Cash Giveaway! Morning you guys! Its gonna be a great Wednesday because in addition to tutorial #3 in the Modern Pin-up series (which will come a bit later), you're also getting a super great giveaway! There are so many fab and fashionable ladies collaborating to bring you this prize, and I'm so excited to be a part! Make sure to follow the links and check out these ladies for yourself, and now lets get on to the good stuff! Have an awesome Wednesday, and make sure to check back in later on for today's tutorial! Wow, what an awesome and generous giveaway! What a great idea. Thanks for doing this giveaway. That's amazing. Love your blog - love your hair tutorials! I'm excited to see more video tutorials! Thanks for the fun giveaway...fingers crossed!